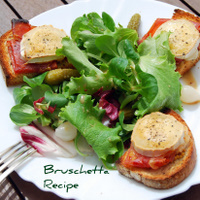 The original bruschetta recipe is an appetiser from central Italy. Basically it is just grilled bread, rubbed with garlic and topped with virgin olive oil, salt and pepper. The most popular one outside Italy is a topping of basil, fresh tomato, garlic, and onion or mozzarella. However there are now many different variations to choose from using spicey red pepper, tomato, vegetables, beans, cured meats and cheese. The great thing is they are all very quick and easy to prepare and make a great starter or snack. Lose the onion, basil, salt, pepper and mozzarella or parmesan. Pre heat grill on med/high heat and toast each side of the bread slices. While hot rub one side of the toast with half a clove of garlic and then drizzle each with about a teaspoon of olive oil. In a bowl mix together the tomato, onion, basil, salt and pepper. Pile even amounts on to each toast. Serve immediately - or if you are using the cheese sprinkle it on the top of each one and grill until melted, then serve. Then place a slice of tomato on to the toast, followed by a slice of your favourite cured meat.....jamon serrano, parma ham, chorizo, salami etc. Finishing with a slice of goats cheese. Put back under the grill until the goats cheese has melted. 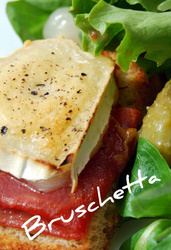 Serve immediately with some salad......delicious!